To make people feel comfortable and not sick, the air in the apartment should not be too dry. The optimal limits of moisture content in it are from fifty to seventy percent. And this is especially important for young family members. 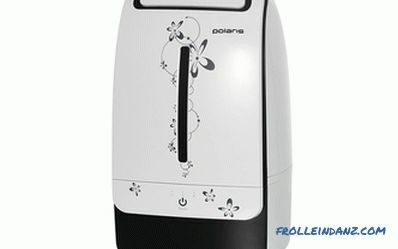 Therefore, caring parents consider it necessary to buy a humidifier for children - which one is better to choose from a considerable variety, we will try to find out. The smaller the age of the baby, the more tender his skin. She is extremely susceptible to negative factors. And if the air is too dry, the skin of the children (especially for the newly born) also dries up, can become inflamed and flaky. The nose of the baby lays, because of what he constantly wakes up during the night and daytime sleep. In addition, it is fraught with allergic reactions, frequent colds. The result - whims, crying, fatigue and irritability. 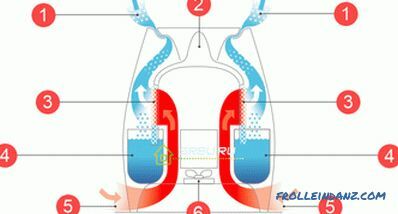 But if there is a device capable of creating a comfortable microclimate (humidifier), the situation magically changes. Son or daughter begin to sleep better, less naughty, and colds much less often come to the nursery. The skin, even without a special baby moisturizer, does not dry or irritate. And still the nasal congestion disappears, which is quite natural - after all, it becomes a frequent companion of dry room air. Most notably, the beneficial effects of humidifying appliances in the winter, when hot batteries with heaters take a record amount of moisture. At this time, its level in the air can drop to twenty percent - this is not at all good. Approximately this level of moisture in the desert. And this is not the limit: if paper wallpapers are pasted on the walls or if they are sheathed with plasterboard, then humidity can drop to 10 percent. After all, both of these materials strongly absorb moisture from the air. And if the situation has worsened so much, then no wet rags on heating appliances will save - drastic measures are needed. Indeed, in these conditions, it is not easy to raise the level of moisture to the optimum. 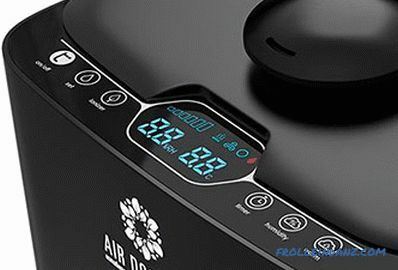 It is necessary to evaporate about three liters of water per day, with which only specialized household appliances for air humidification will cope. 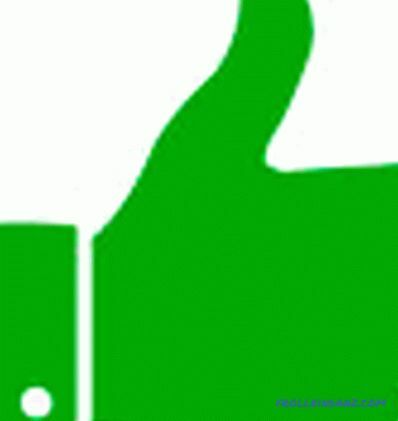 Next, we will talk about its different types, as well as advantages and disadvantages. 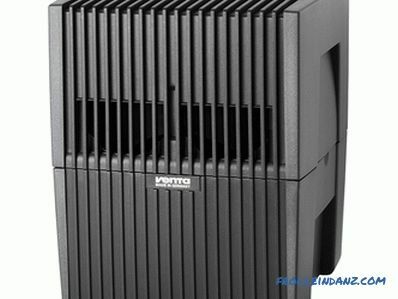 This type of humidifier is characterized by the highest efficiency. The principle of their work consists in the evaporation of water due to the oscillatory movements of a special membrane. Immersed in a water tank, it causes water to turn into steam, which does not heat above room temperature. This is a plus - cold steam will not be able to burn a small child, who has approached the unit very closely out of curiosity. And you shouldn’t believe the claims that ultrasound from these devices has a negative effect on people and pets. The humidifier uses absolutely safe frequencies. What is really harmful is the electrostatic radiation emitted by television screens and monitors. It is better to take them out of the nursery - it will really be useful. The moisturizing device, by the way, partially compensates for this negative effect, reducing the electromagnetic radiation. When you buy an ultrasonic humidifier, you should know that it is best to put it somewhere higher. Let it be, for example, a bedside table or a stable shelf. Such placement is a guarantee of faster distribution of steam in the airspace. As for the care, there is one nuance - the unit does not accept hard water, giving out white bloom due to it. Therefore, it is required either to buy emollient cartridges once every three or four months, or to fill in water with a special one - purified, passed through the filters. 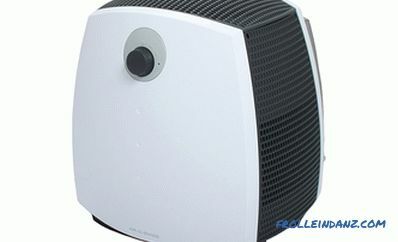 If the air in the room is too dry and the batteries are very hot in winter and do not have adjustment possibilities. The powerful device will easily cope with this problem and will allow to achieve comfort for a small family member. If your child’s sleep is very sensitive, and from the slightest noise, he can wake up. 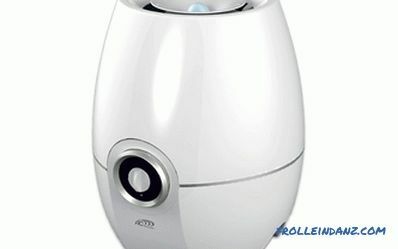 The humidifier of this type works very quietly (it is barely audible gurgling and whispers, releasing steam), it will not disturb anyone even at night, when there is silence around. If the baby’s room is large enough, the power of the ultrasound device is sufficient to handle solid volumes of air. If it is often enough to quickly increase the humidity to the optimum level. If from time to time there is a need to transfer the unit to other rooms. 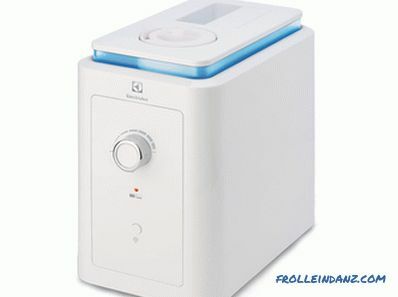 If you don’t need to buy purified water or special cartridges to soften it. The design is simple, the shape is quite stable, light weight, compactness. The backlight in a pleasant blue light does not blind the eyes and does not interfere with night rest. In addition, it can always be turned off. When water runs out in the tank, the machine automatically shuts off. A white patina is formed, but in minimal amounts. Puddle around is not formed. Convenient rectangular tank, into which you can easily pour water. The assembly is good, high-quality plastic, without an unpleasant "chemical" smell. Control the only convenient and reliable mechanical wheel. The device is effective - after two hours freshness is felt. There is a regulator of moisture saturation. The need to use purified and softened water (ideally distilled). 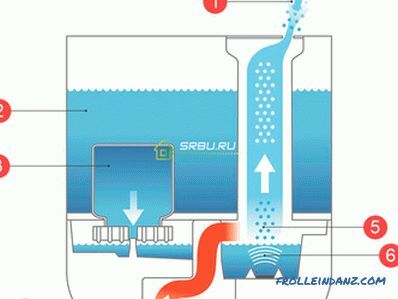 Although it is convenient to fill the tank with water, it is necessary to turn it over (by draining the remaining water), and unscrew the filter as well. Sometimes a bubbling is heard (as in a cooler). The regulator cannot influence the intensity of the height of the steam jet. Results: This budget-class device copes well with the task of moistening in a children's room of up to twenty or thirty square meters. The minimum of settings, reliable mechanical control, stylish concise design and compact dimensions - its undoubted advantages. A blue nightlight is convenient, and the rare gurgling at work usually does not interfere with babies. But the white bloom on children's things may well appear. So it is better to pour distilled water. And this is an additional cost. So parents should think about it in advance. 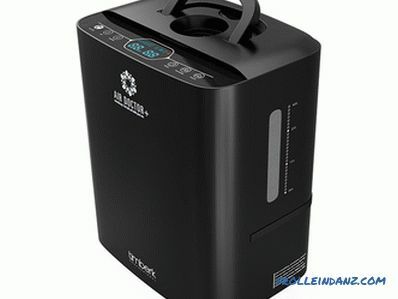 Five-liter Water Tank - for devices of this type is very good. This volume is enough for sixteen hours of continuous operation. Automatic shut off when the water in the tank runs out. The device consumes electricity modestly. Nothing extra - two modes and only the necessary buttons. The device is quiet, it does not interfere with sleep. Stands steadily on a support - there is no risk that children or pets will turn it over. The indicators are small (two tiny lights), the light from them does not interfere at night. Good quality (even though it is China). In the lower third of the tank water level can not be seen. The sensor button is pressed tight. To add water to the tank is inconvenient. It is necessary to turn it over for this. The power cord is short - sometimes you have to buy an additional extension cord. And this in the nursery is not always safe. The sound is too loud when switching modes or turning off the device. Tap water is completely unsuitable for work. After some time, a white bloom may appear on the objects in the room (its intensity directly depends on the quality of the water poured in). Steam flow cannot be adjusted. Constantly blowing upwards at an angle of 30 degrees. Once every half an hour, characteristic "glitches" are heard. Results: The humidifier of this model performs its function well, creating a comfortable microclimate in the nursery, protecting children from colds, nasal congestion, peeling of the skin. Silent work, no need to pour water often, parents will like. But remember that this water should be well cleaned. 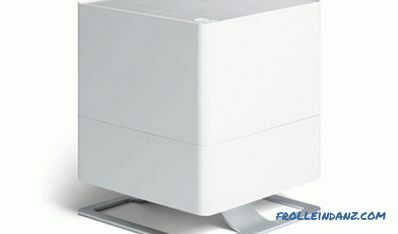 Simultaneously with the purchase of this model, it is also necessary to acquire a humidity sensor in order to know when it is necessary to humidify, and when it is not necessary. Price and quality are combined quite harmoniously. The device is beautiful in design, the plastic from which it is made is of good quality, the assembly is good. Moisturizes very, very quickly; steam can be directed. The control panel is clear and convenient. There is practically no noise during operation. There is an ionization function, as well as additional filters (they are lowered into the water tank). Buck volume (four liters) - with an average speed of eight hours it will be enough. It is possible to turn off the display for the night in order to sleep without interfering with its glow. During operation, there is almost no white plaque on the furniture (only on the screens of old CRT TVs). There is a timer that can be set for the desired length of time. There is the possibility of flavoring the air with a few drops of essential oil. When carrying, the handle may fall off on one side. Need insurance. The opening for pouring water is rather narrow, which makes it inconvenient to wash the tank. It is advisable to stock up with a bottle brush. Lips loudly when water runs out. At night it is not very good. Indicator light would be more convenient. The built-in hygrometer is not very accurate. He overstates the figures. Need filtered water - the one that is out of the tap is not suitable. However, some for this purpose use boiled water. Results: This quiet, beautiful and inexpensive model will help to quickly cope with the dryness of the air in the nursery. The presence of options for aromatization and ionization will protect the baby from colds. If you do not feel sorry for the money for purified water - a good option. These devices saturate the air with water in a natural way and work much slower than ultrasonic devices. Especially when the dryness of air masses is significant. After all, at first, the remaining moisture will have to be absorbed by the walls, wallpaper, floor, as well as the other objects in the room. Therefore, in the first days of the overall level of humidity rises very slowly. However, then it is well maintained due to the evaporation of water droplets and the circulation of moist air. A unit of this type is arranged as simply as possible: a filter through which the air flow moves (it is driven by a fan) is lowered into the water tank. At the same time, the air is not only saturated with moisture, but also cleared of large particles of dust. They are retained by the filter, which is required to be rinsed weekly under running water, and changed once a year. In such devices the fan is often located in the upper part of the case, then they have one common drawback - some noise during operation. However, for different models, this figure may differ quite significantly. It all depends on the specific design, power, manufacturer, assembly. But there is a dignity common to all traditional devices. They have no problems with water - you can pour it straight from the tap. No white bloom is formed - because the evaporation of water is natural. So that over-humidifying the air will not work, but you can only bring its humidity to the norm. 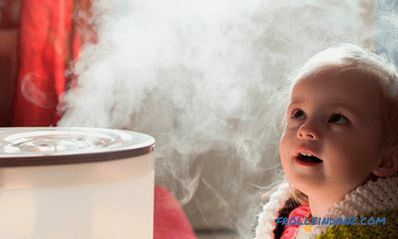 Often, these two factors are tangible reasons for those who decide which humidifier to buy for a child. 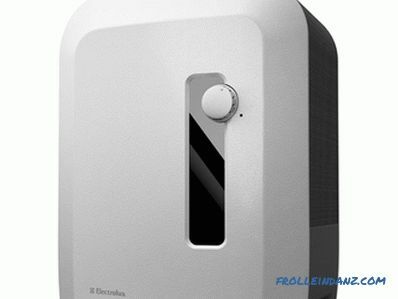 You are not going to purchase an air purifier along with a humidifier. Air temperature in the nursery is high. Your baby is very curious and pulls the knobs to everything unusual and interesting (the discreet design of this device and the absence of a steam coming out are unlikely to interest). Very stylish cubic design, compactness. Moistening - at a sufficient level. Unpretentiousness for water poured inwards. There is a scale filling capacity and a hygrostat. It is possible to use flavoring. Water and electricity are consumed a little. It is convenient to wash the flat tray. The device can automatically turn on (when the humidity is low) and turn off (when its optimum level is reached). Silent sounds at work remind the sound of the sea and act soothingly. Filters (which need to be changed every three months according to the instructions) are quite difficult to get. And they are quite expensive. Inconvenient topping up water (this is easy to do only from a bottle with a narrow neck, for example, one and a half liters). The upper grille is quickly clogged with dust, and it is difficult to clean it. Performance is not too high.In practice, the device will be enough for ten to fifteen square meters. Results: This wash is a good budget option for a not too spacious nursery. 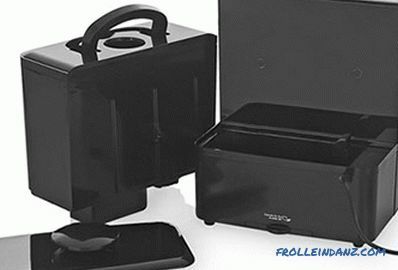 It does not make noise, does not interfere with the child to sleep, well raises moisture naturally. 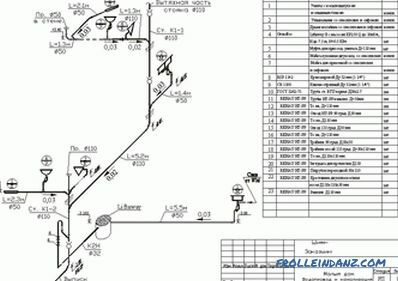 The device is designed for continuous operation, able to work on ordinary water from the tap. But there is one "but" - when you need to change the filters, it takes time, nerves and money. Very beautiful design, a little futuristic. Compact dimensions for a traditional humidifier. Unusual ease of use. It is only necessary to pour three liters of water into the tank and put the switch in the desired mode by selecting one of the two. The night mode is very quiet. Disassembling and washing the device is easier than ever. After all, this is, strictly speaking, just a beautiful plastic bucket with a built-in fan and a filter floating in the water. The fan is at the bottom, so there is no rattling and vibration (as in washes). Natural evaporation of water is a guarantee of the absence of white bloom on furniture. It is very convenient to pour water into the tank. At night, in a quiet mode, it is not very effective - only sixty grams of water per hour evaporates. The device is suitable only for small rooms - it covers the area of ​​thirty square meters with difficulty. The evaporative filter is quickly clogged with salts contained in water (because of which the performance of the humidifier is noticeably reduced). And in the store this part, which is desirable to change every two months, is difficult to buy. 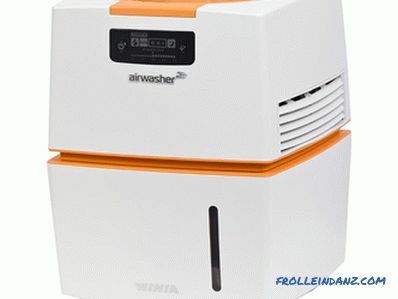 Special purification of the air (except for the removal of some large dust particles) should not be expected. Results: This is an inexpensive device suitable for a small nursery (up to twenty-five square meters), provided that the problem is only in the air dryness rather than heavily polluted. Quiet work does not interfere with the child's sleep - the device can be placed even very close to the bed. But, perhaps, parents will have to run around in search of a filter that is not always possible to find. These devices are similar to the previous ones: they also have natural evaporation of water. But they do not have an evaporative filter that needs to be changed. The unit works by rotating plastic discs immersed in a water tank and blown by a fan. 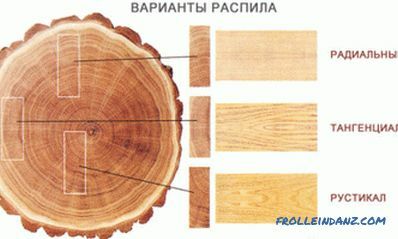 The total surface of these discs is quite large (they are connected to the drum in terms of construction), therefore humidification is faster than in classical humidifiers. Sinks do a good job with dust and allergenic particles (for example, pollen). These particles collide with the surface of wet discs, and then they are washed away into the sump by a water jet. A number of models have a useful ionization function, which, due to static electricity, attracts even more dust. 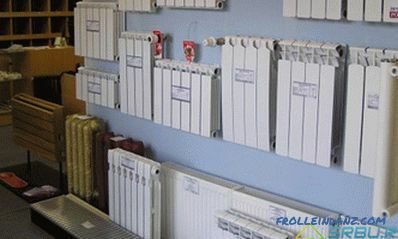 The disadvantages of the units are solid dimensions, as well as a rather high cost. But they work quietly enough, they are effective even for large rooms, they do not require the purchase of consumables and (like traditional humidifiers) are not picky about water quality. After all, they also use the natural process of cold evaporation. You are not able to buy purified water. It is planned to leave the device running for days. There is no desire to spend money on consumables. 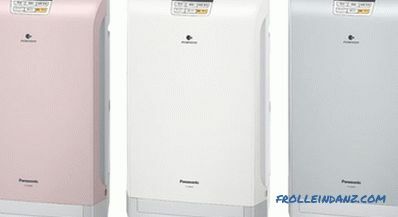 A separate air purifier in the nursery will not be bought. The baby is sleeping anxiously, any noise can wake him up. Multifunctionality, presence of four modes of moistening. Availability of timer and digital display. There is a useful "health care" feature. When the optimum level of humidity is reached, the device switches itself off. There is a built-in water level sensor. Buzz during the work, at the same time plastic of a casing resonates. A small water tank (just over three liters in total). However, it takes about twelve hours. Removing the filter to wash is not so easy. To do this, you have to scroll the drum. Humidification is not too intense (but evenly throughout the room). A notch for the arm (to move, for example) is only from one side. When moving a working device, water may leak slightly. Results: This car wash is well suited for those parents who care about the optimal balance of cost and quality. At the same time, it copes well with its duties, is easy to clean and clean, without requiring replacement of expensive parts and thoroughly purified water. Dust cleared well, allergens from the air are also removed. Quiet work does not wake up even a nervous child at night. After the device is working, there is no white bloom on objects in the room, absolutely any water is suitable. There are no bright LEDs interfering at night. It is very convenient to fill the tank with water. It is transparent and allows you to control the water level. The valve cover has a simple and reliable design. Discs are easily rinsed in the shower. There is no need to disassemble the drum (which can be washed in the dishwasher). In night mode, work is quiet - you won't wake the baby. Even after three weeks the water in the pan does not start to rot. No legs - because of this, moving the device can scratch the parquet. The tank is too small, it’s not seven liters (as in the description), but only four liters. 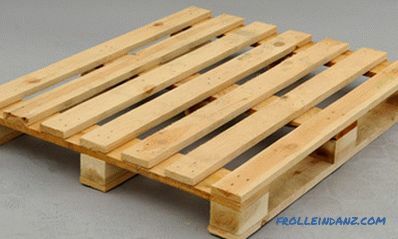 The volume of seven liters is together with the pallet. In winter, there is enough water in it for about twelve hours. The plastic from which the device is made is quite fragile. It is necessary to wash the tray and discs about once every four days. Otherwise, there is a smell of dust. Sensible periodic sound of gurgling. At maximum speed, you can feel the breeze coming from the sink - so you cannot put it near the baby cot. The unit does not want to work on uneven or shaky grounds. Results: This unit provides high-quality natural moisturizing. And cleaning it is also at the level - the water in the pan already after three days will show it (with its dirty color and particles of debris). Sink well put in the nursery to work in continuous mode - on a flat surface and not close to the bed. But keep in mind that a baby with an especially sensitive sleep gurgling can wake up. It is advisable to lay additional pads under the bottom. The design is extremely simple and very reliable, energy consumption is low. 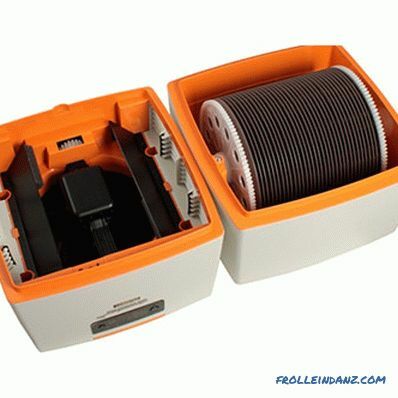 High-quality German assembly, sturdy and beautiful plastic, convenient maintenance. Compactness, which makes it possible not to worry too much when searching for the location of the device. The tank lasts two days, no less. You can use tap water. The washing is assembled and disassembled very quickly, no special efforts are needed for this. The night mode is quite quiet - children usually do not wake up. LEDs (blue button illumination) is too bright. It helps sticking them with black tape or overlaying cardboard strip on top. Price (higher, for example, than an ultrasound machine). Pouring fresh water from the tap, you'll feel the smell of bleach. Therefore, it is desirable day to defend this water. There is no built-in hygrometer. Results: The device is well suited for children's areas up to fifteen square meters. Humidification and air purification is quite acceptable. But if the air is very dry, it is worth considering that the first use will have to wait about a week until all the objects in the room are saturated with moisture vapor. Very quiet night mode - no more than fifteen decibels. Air saturation with moisture occurs quickly and efficiently.Even at the sparing mode at least three hundred milliliters evaporates. The device looks nice, assembled solidly (in the Czech Republic). There is a possibility of flavoring with the use of any aromatic oil. Maintenance is easy: wash the water tank and pan once every two weeks. Once a month, use a means of scaling. The tank cover is located on the back wall - because of this, it is not very convenient to pour water into it. It is inconvenient to remove the washing plates (due to the attachment of the axles holding them). At night gurgling can prevent (about once every half hour). The problem is solved if you remove the tank at this time. The unit is not very suitable (cumbersome enough, by the way) for carrying - you can damage it. All parts from which the device is assembled are not rigidly fixed. If your kid is curious, he can get to them and make out. The water completion signal - a click - very loud and unpleasant. Results: Washing this model is suitable for a nursery, where a calm baby lives. 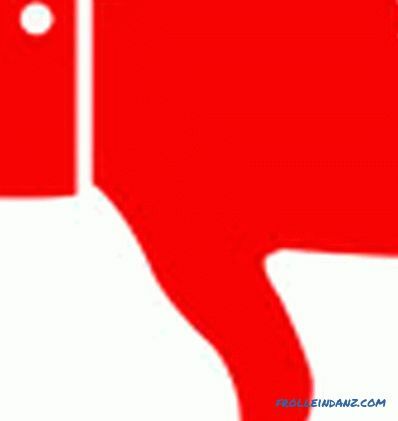 Who does not try to reach out and disassemble everything (otherwise the device will quickly come to an end). The unit performs its work well, it hardly interferes with sleep (you can get rid of gurgling, as mentioned above). Expensive, of course, but reliable. And consumables do not need any. The main thing - do not forget to pour water every day. And if you are not too lazy to do it, then you can look at this model. Consumables are not needed, the device is unpretentious, it works according to the principle of natural air saturation with moisture. Dust from the air is removed well. The design is simple, the maintenance too. Air humidification on a solid "five", cleansing - on a "four" (picks up about eight-tenths of dust). It is advisable to wash the tray with a brush weekly, since there is a lot of dirt there. The water tank is slippery and not very comfortable. On the cover thread uncomfortable. Overall dimensions - you need to think about the place where to put the device. When another portion of water comes out of the tank, a distinct gurgle is heard. At night, it can wake up. There may be a noisy model, so you need to check the device well before you buy it. It should not buzz when you turn on the second speed. The power cord is coming out in an awkward place. The housing in the slots and the fan accumulate over time, dust that is difficult to remove. There is no automatic shutdown when water runs out. Results: The device is unpretentious and easy to maintain. It does not need to buy more purified water or consumables - direct savings. A sink can be put in a not too big nursery - it will cope well with air moistening and clean it from basic dust pollution (but no more). The child will stop coughing and sneezing, his sleep will improve. 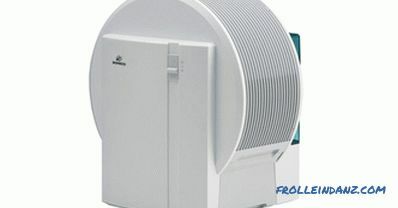 It is advisable to choose a place to install the unit at the level of a meter or one and a half meters from the floor. 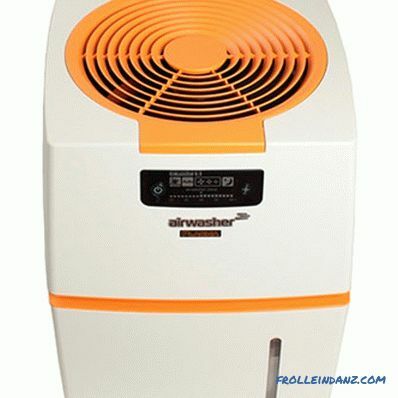 These are air purifiers with several filter stages for various purposes and a humidification function. The devices are quite solid and very high-quality coping with their tasks. In fact, these are traditional type humidifiers (with cold natural evaporation), equipped with an additional filtration system. They can be equipped with both a conventional evaporative filter and a special aerodynamic design that replaces it. Thanks to this design, dust (even the smallest), as well as all kinds of allergens, odors, chemicals, smoke and smog are removed from the air. These devices are virtually silent, have many modes and extremely easy to maintain. They use technologies of purification of air masses to the maximum - and the most modern ones. But you have to pay for everything - devices equipped with all these options are the most expensive. The child is weak, prone to allergic diseases, asthma, or has heart problems. The house is located in the industrial zone, where the air is saturated with exhaust gases and harmful "chemistry". The baby sleeps very badly, constantly waking up. Water is not of the highest quality. You choose only the best humidifiers for the children's room, and the rest does not matter. A sufficiently large water tank - nine liters. It is enough for a day with constant power on. In the "auto" - for forty-eight (or even sixty) hours. The design is simple, the menu is clear and convenient. If necessary, it is easy to disassemble the drum with the key that comes in the kit and clean it. The operation is very quiet - not only at the first, but also at the second fan speed, the unit is not audible. The Korean assembly is excellent, the plastic from which the case and other parts are made is of very high quality. It is convenient and easy to pour water and clean the tank. 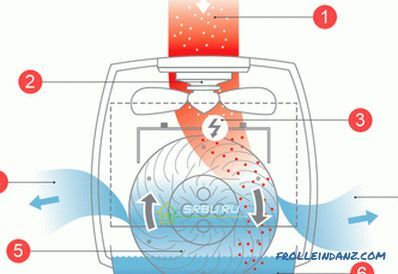 The device is able to humidify even a large room, bringing the moisture level to 55%. There is an ionization function to cope with large amounts of dust. Having a very accurate hygrometer. There is a window ahead, through which you can see how much water is left in the tank. Using the dampers, you can change the direction of the flow of exhaust air. The declared processing area is large - up to sixty square meters. > The screen backlight is too bright. The ionization option cannot be disabled. The display also does not turn off (which sometimes interferes at night). The warranty is small - just one year. Service centers a little. Results: This Korean model is useful in a large children's room. Especially where it is supposed not to turn off the device for days. Even if the child does not sleep well, a quiet humidifier will not disturb him. Convenient control, high efficiency of moistening and quality of cleaning will allow you to create a comfortable microclimate for your baby without any hassle. This is especially important for weak children. 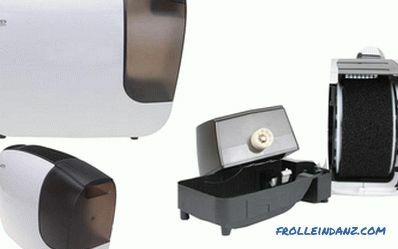 Fast and high-quality hydration, many modes, including fully automatic. 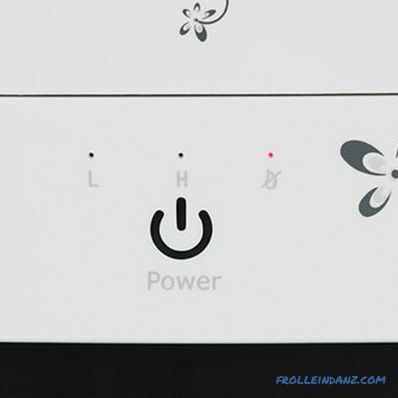 The presence of sensitive sensors that instantly react to any odors and give a signal to eliminate them. Natural evaporation eliminates the appearance of white bloom on the furnishings. The air is taken from the side and the front and goes up. This is optimal for a humidifier. A damper allows you to control the flow of outgoing air. Elegant design, low electricity consumption. Instruction in Russian, simple maintenance, excellent build quality. Availability of three long-life filters (designed for ten and seven years of work). Lack of remote control and wheels to move. The water tank is a bit small - its volume is less than three liters. Signal LEDs are very bright - they prevent you from falling asleep. Expensive consumables, and the device itself is not cheap. Results: The smart device is able to work almost autonomously. It is enough to fill the tank with water (which is enough for about a night). Sensors respond quickly to unpleasant odors, which are immediately eliminated. The presence of a three-stage filter perfectly relieves air from allergens. Such a unit is useful if the child has poor health, susceptibility to allergies and colds. The climate complex is used as a stationary humidifier (as it does not have wheels). It is necessary to install the device where the baby does not reach (there is no lock) and so that the bright light bulbs are not visible from the bed. Simple design, low price, beautiful design (in the form of a vase). No need to buy special treatment tools and replacement filters. Natural evaporation, leaving no residue on furniture and other items. Good level of moisture in the air. 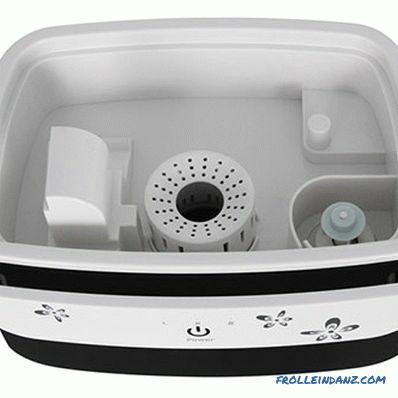 The unit is easy to care for: wash, wipe, fill with water. The filter (it is only one, of circular type) has to be washed often enough, about once every three days, so that it does not “bloom”. In the night mode, the treatment area becomes three times less than what is stated in the specifications. No insulation on the legs - the wooden floor starts vibrating when the device is in operation. In intensive mode and installing on the floor can form a puddle. Results: This device is also suitable for allergic children. It does not require special care and can be left on overnight (as it is not very noisy and completely safe). Better to put it not on the floor, but higher - so the efficiency of use will increase. For example, on a shelf or on a bedside table. It is worth paying attention to rather large dimensions, having checked in advance whether the humidifier fits in its intended place. * The rating and reviews are based on objective data obtained using Yandex services. Market and Products @ mail. ru.